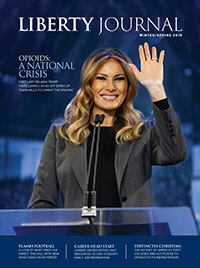 William Byron, driver of the Liberty University No. 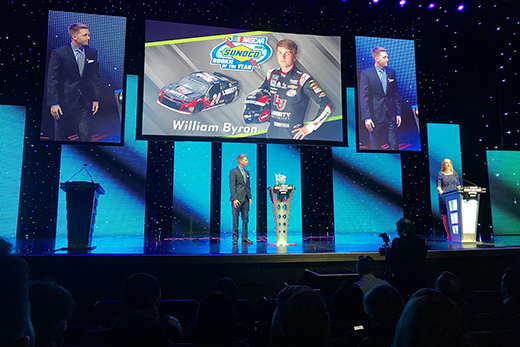 24 Chevrolet Camaro ZL1 in the NASCAR Cup Series, officially accepted the Sunoco Rookie of the Year award at the NASCAR NMPA Myers Brothers 2018 Awards in Las Vegas on Wednesday. The event is part of the annual Champion’s Week activities and honors those who have made outstanding contributions to NASCAR. 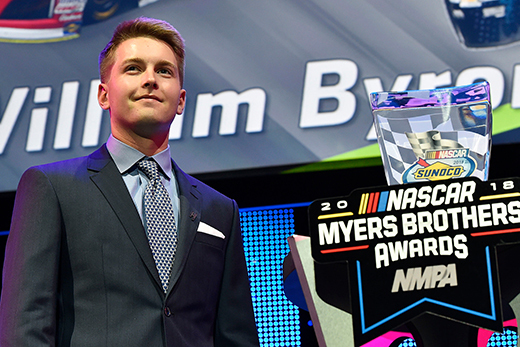 At age 20, Byron became the third-youngest driver to win NASCAR Cup Series Rookie of the Year honors. (He turned 21 on Thursday, Nov. 29.) The No. 24 team secured four top-10 finishes, leading 61 laps along the way and ultimately finishing 23rd in points. Byron, who is pursuing a degree in business communication through Liberty’s online program, has now won Rookie of the Year honors in four straight racing seasons, following the Xfinity Series, Camping World Truck Series, and the K&N Pro Series East. He is only the second driver to sweep the honors in the Xfinity, Truck, and Cup Series in consecutive seasons. Byron is the fourth Hendrick Motorsports driver to claim Rookie of the Year honors — following Gordon (1993), Kyle Busch (2005), and Chase Elliott (2016) — and the third to win it driving the No. 24 car (all but Busch). “This was a goal of ours, and I’m thankful for all the work that went into getting us to this point," Byron said in his acceptance speech. "As we set out for 2018, I couldn’t wait to live a dream of mine by competing in the Cup Series." He thanked those who made the season possible, including his family, everyone at Hendrick Motorsports, NASCAR and its partners, the sponsors of the No. 24 Chevrolet Camaro ZL1, his No. 24 team, including crew chief Darian Grubb, as well as his Hendrick Motorsports teammates. Liberty will remain a primary sponsor again in 2019 (view the schedule below).